You'll start cooking up plans for tomorrow when you hear the jet skis fly by. Suddenly you've forgotten about all those things that were competing for your attention back home. Set your alarm each night so you don't miss it. Adding chocolate chips upon request, for kids who ask politely. Let your climbers and sliders have at it. Your kids will love the playground and the arcade. You're a 5 minute drive to Hawk's Landing Golf Club and a 10 minute drive to Falcon's Fire Golf Club. Relax on the balcony and enjoy the view of the courtyard. Direct access to beautiful, spring-fed Lake Bryan. Sprawling, Mediterranean-style architecture. Put them together and what do you get? The tranquil, lakeside retreat, Bryan’s Spanish Cove condo resort. Once you get settled in your apartment, change into swimsuits, grab water wings and goggles and slather everyone in sunblock before heading to the lakefront pool. Grab a lounge chair and get comfortable, you’re going to be here for awhile. 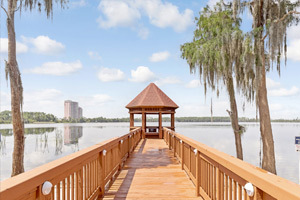 The “Old Florida” vibe of Bryan’s Spanish Cove amplifies nature’s simple pleasures like strolling to the dock for the nightly sunset, heading out on a canoe, or partaking in some of the state’s best bass fishing. Take advantage of the free use of paddle boats, canoes and fishing poles. Thinking burgers for lunch? You’re in luck! There are BBQ grills throughout the resort. Recruit some side-dish carriers and get ready for a family cookout. The kid’s playground will wear out the little ones just in time for their afternoon nap. There’s an arcade if the big kids need something noisier or more electronic, but other than that, plan to unplug from the everyday pressures and enjoy the low-key pace. Spacious two-bedroom floor plans sleep six guests and have enough room for the kids along with their stuffed animals, blankets and even a few imaginary friends. Fully equipped kitchens have everything you need to make everyone’s favorites. The kids will be begging to help bake your famous chocolate-chip cookies (and be the official taste testers). And freezers are perfect for storing dessert – popsicles for the kids (and a Ben & Jerry’s stash for the grown-ups). In-Suite Washer/Dryers make post-chocolate clean-up a breeze. TVs with DVD players are perfect for family movie night. Bring favorite movies from home, pop some popcorn and call everyone into the living room. First kid on the couch gets to choose the movie. So what will it be – Frozen or Beauty and the Beast? Once the kids are in bed, relax with a soak in the jetted tub. Wine optional – but recommended. Bryan’s Spanish Cove is less than five miles from SeaWorld’s rides, shows and animal experiences. Antarctica: Empire of the Penguin is a motion-based simulator ride that allows you to experience the South Pole through the eyes of a penguin. The ride offers two versions: Little ones will enjoy the “mild” version while daredevils will appreciate the “wild” version. Shamu’s Happy Harbor is a kid-friendly roller coaster that will be a big hit. Go for a ride on Mako, Orlando’s tallest, fastest and longest roller coaster. Dolphin Days, Sea Lions Tonite and Pets Ahoy are just a few of the shows offered at SeaWorld. Experience the magic of Walt Disney at Magic Kingdom® – home of the classic attractions Dumbo®, Pirates of the Caribbean® and Country Bear Jamboree®. The Be Our Guest restaurant, located in New Fantasyland, allows you to dine in the Beast’s castle. Visit 11 countries in Epcot’s® World Showcase®. Ride through Arendelle in Frozen Ever After. Feeling brave? Head to Hollywood Studios and ride the Twilight Zone Tower of Terror. See Beauty and the Beast Live Onstage. Animal Kingdom features flamingos, African elephants, giraffes, gorillas and hippopotamuses. Pandora – The World of Avatar is Animal Kingdom’s newest attraction (as of May 2017). Movie fans will love Universal Studios® and Universal’s Islands of Adventure®. Transformers, E.T., Harry Potter, Shrek and The Mummy are just a few of the films with rides at Universal.